Two young women with cattle in a Mandari cattle camp in the dry season, with an extended family homestead visible beyond. The girls are wearing chain-link aprons favoured by some Mandari Köbora women, with a small decorated skin triangle apron over the top, as well as metal armrings. Morton, Chris. 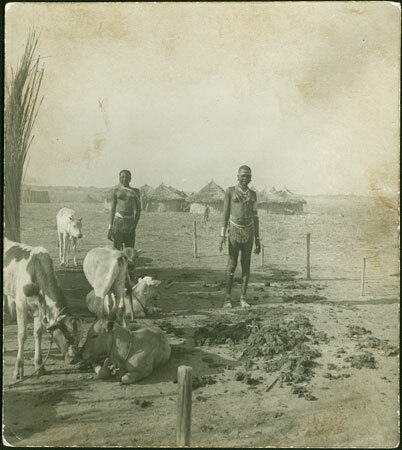 "Mandari cattle camp" Southern Sudan Project (in development). 03 Jan. 2006. Pitt Rivers Museum. <http://southernsudan.prm.ox.ac.uk/details/1998.97.299.2/>.